Destroy and conquer what ails you. 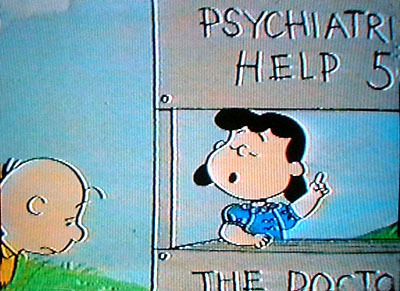 Peanuts by Charles Schulz. than to take a handful of candy canes and smash them with the bottom of a soup can. Unwrap and pulverize the peppermint candy into sweet shards and dust. Listen to the solid thud of the can as it slams against the floor. Watch as the smooth, slender sticks splinter and crack. Feel the sense of satisfaction spread with the destruction. During this season of artifice that builds to a crescendo of over-indulgence and credit debt, it feels good to break something down. So carry on! Melt dark chocolate into thick whipping cream, add a splash of peppermint extract and heat it until it turns into a smooth, rich ganache that will be sandwiched between thin layers of white chocolate and crushed candy. 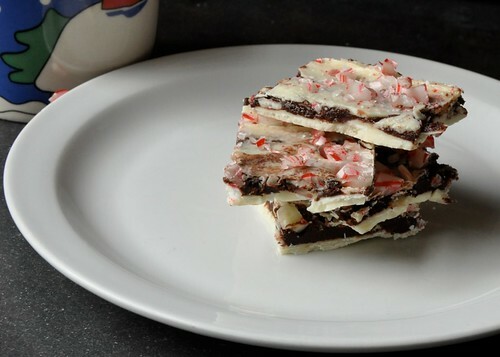 This version of peppermint bark, with its layers of chocolate that are heated, then cooled, requires time, time enough to drink a cup of tea, to knit a few rounds, to read a chapter, to take a cat nap. Do this. You’ll be doing yourself (and everyone you know) a favor. Put a piece of foil, slightly larger than a 12 x 9-inch rectangle on a baking sheet. Stir bittersweet chocolate, cream and peppermint extract in heavy medium saucepan over medium-low heat until just melted and smooth. Cool to barely lukewarm, about 5 minutes. Using icing spatula, spread bittersweet chocolate in even layer. Refrigerate until very cold and firm, about 25 minutes. Rewarm remaining white chocolate. Working quickly, pour white chocolate over firm bittersweet chocolate layer; spread to cover. Immediately sprinkle with remaining crushed peppermints. Chill just until firm, about 20 minutes. Lift foil with bark onto work surface. Cut into desired shapes and sizes. (Can be made 2 weeks ahead. Chill in airtight container.) Let stand 15 minutes at room temperature before serving. Notes from the cook: Firstly, I rounded up the amounts in this recipe in order to use all the white chips, chocolate and candy canes because I have no patience when it comes to recipes that leave me with leftovers of a special ingredient, which just gets wrapped and shoved into the cupboard to be forgotten. Secondly, the original recipe, as well as those reprinted on blogs like Orangette and Soule Mama, recommended using real white chocolate, which contains the cocoa butter of true chocolate, but lacks cocoa solids, the element responsible for milk and dark chocolate’s brown color and nutty roasted flavor. I didn’t and here’s why: In a Cook’s Illustrated taste test that compared real white chocolate alongside “fake” supermarket brands, the losers weren’t confined to the fake brands. I couldn’t find Guittard Choc-Au-Lait White Chips at my grocery store, so chose Ghirardelli Premium Baking Chips, Classic White, a fake chip that tied for second place, beating out the real white chocolate bar made by the same manufacturer. This chip’s “sweet cream” flavor was “rich,” and “milky,” with a “buttery” texture, though some noticed a slightly “waxy and chalky” aftertaste when prepared in mousse. Tempting. I don't like white chocolate and was just about to ask if I could sub milk or more dark when I read your notes on the faux white. I can handle crème fraîche” + strong vanilla. Okay. Thanks. Andrea, I spread my white chocolate awful thin and then I ran out when it came to the top, but just spread what I had, sprinkled peppermint and it tasted just as good as those that had three layers. Denise, your welcome. Happy melting!